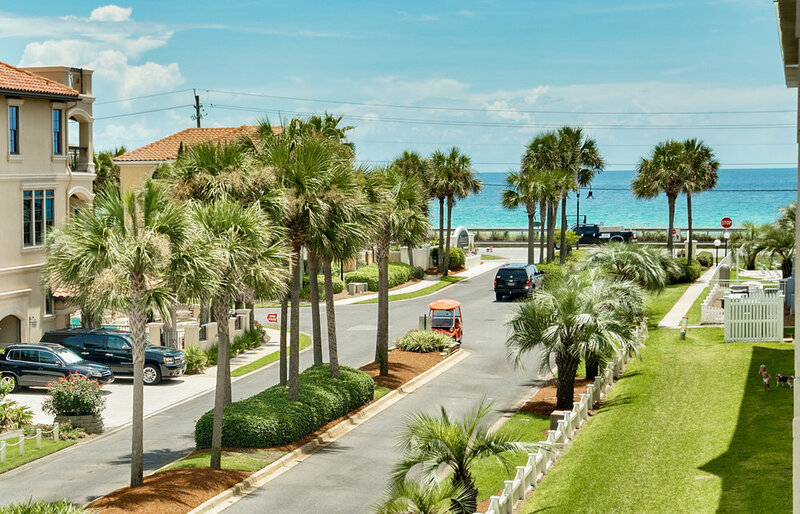 Stretching From Dune Allen to Rosemary Beach, Scenic Highway 30A is an iconic coastal highway that connect small, new urbanism beach communities. With each community offering unique unparalleled design and architecture, 30A is truly an area unlike any other. Alys Beach is an immaculate community located along the Gulf of Mexico, six miles east of Seaside on Scenic Highway 30A. This beach town makes a strong and stylish statement with its signature palm trees, iconic butteries, and its white stucco architecture. The refined and elegant vision for Alys Beach came from the vernacular structures of Bermuda and Antigua, Guatemala. The 158-acre community includes 1,500 feet of beachfront with more than 600 rowhouses, courtyard homes, villas, and compound retreats that are positioned to take full advantage of water views and Gulf breezes. This community features a 21-acre nature preserve, an amphitheatre, Alys Shoppe, several local eateries, neighborhood parks, tennis courts, and Caliza-- one of the most luxurious swimming pools and restaurants in the world. One of 30-A’s planned New Urbanist communities, Rosemary Beach is full of charm— which is just one reason why this beach neighborhood was named by CNN as one of America’s most romantic small towns. The grand homes are interconnected by a discrete network of pedestrian paths and boardwalks, which become even more magnificent at night, basked in the soft flicker of gas lanterns. Wood-planked pathways flow through the town, often revealing hidden amenities such as playground, fountains, tennis courts, or one of the community’s several swimming pools. Trickled throughout the community are The Merchants of Rosemary Beach - a collection of quaint shops, boutiques and restaurants. Grab a hand picked book from The Hidden Lantern and treat yourself to a drink at Amavida before walking to “The Long Green.” This grassy stretch is a frequent host to outdoor festivals, markets, concerts, and charity events. This gated community is located on 3,000 feet of private beach on the Gulf of Mexico and is surrounded by Draper Lake-- a rare coastal dune lake. The 28-acre, private access lake borders The Retreat on the western boundaries, the Gulf on the south side, and the conservation preserve on its north, providing the ultimate peace and privacy. The community’s private floating dock allows convenient access to paddle boarding, canoeing, and kayaking. The Retreat’s private Beach Club boasts panoramic views of the Gulf of Mexico right from the infinity edged pool or one of the private, covered pavilions. Planned by Duany Plater-Zyberk & Company, Seaside was designed with one goal in mind - to create a social atmosphere where people enjoyed to be. The community focuses on walkability, and architectural elements, such as porches, that promote community interaction. Seaside is characterized in large part by the traditional style of the South. Like its neighbor and successor WaterColor, Florida cottage-style homes with clapboard siding and metal roofs line up behind picket fences that run along the shaded path-like streets of Seaside. One of the most luxurious resorts on the Gulf Coast, WaterColor features expansive nature preserves, bike trails, lakes perfect for paddle boarding, shopping, fitness facilities, a spa, award-winning dining and nearby award-winning golf courses. WaterColor’s Beach Club offers direct access to the beach as well as a gorgeous Gulf front swimming deck. It’s a perfect spot to grab lunch, toast sunsets or enjoy a day with friends and family. In the middle of WaterColor, enjoy a perfectly manicured butterfly garden known as Cerulean Park. Town planners also designed gorgeous bridges, boardwalks and an extensive nature trail along the shores of Western Lake. Miramar Beach is a classic beach neighborhood. Filled with old-school shops, beachfront condos and cottages, mini resorts and stretches of scenic views to make any beach lover swoon. Add a list of delicious restaurants and local dives that make this South Walton community one that is popular year round. While the city of Destin is a quaint coastal town by all accounts, it can seem like a bustling city compared to its quiet neighbors in South Walton and 30A. Southern Living named Destin "Number One Beach Town in the South" for 14 years in a row. The Destin Harbor is home to the largest fleet of deep sea fishing charter boats in Florida and Destin is known as the world’s luckiest fishing village.